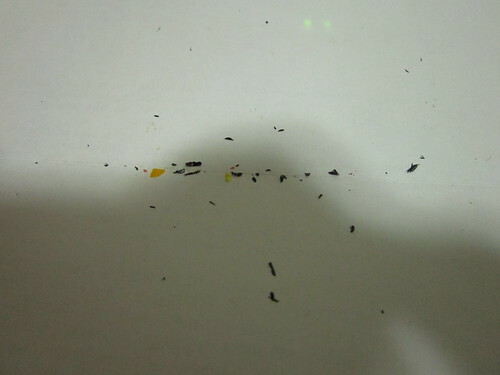 Taken from original post on 07/02/2014 at BZPower Forums. Enjoy! So I did say I wanted to do this quite a while back, so here it is. Decool is a China (I assume?) 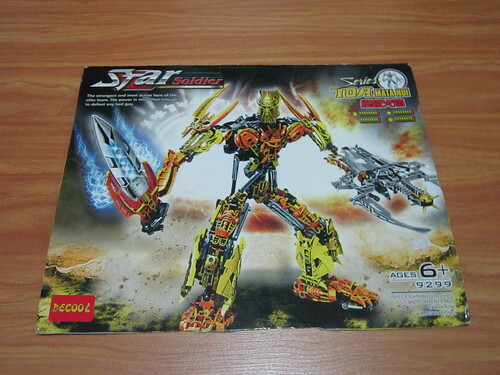 brand that produces knockoff Lego Sets. They have been at it for quite a number of years (no idea how long), but they have recently exploded and skyrocketed in prominence in my region (SEA, and yes, China). EDIT: WHOO! Thanks to Aanchir, images have been reloaded and are visible on forum! Thanks, Aanchir! 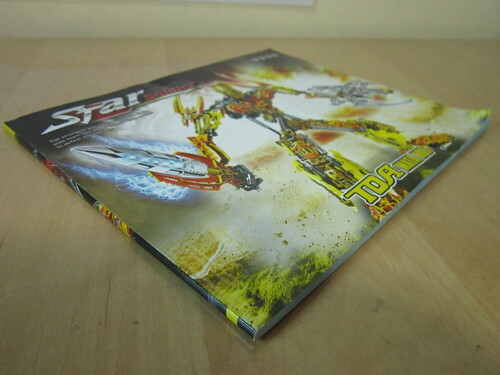 The box itself is rather big (though I reckon smaller than the original) and quite prominent. 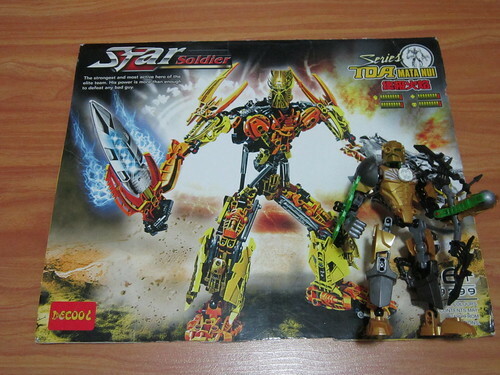 Mata Nui stands in his usual pose as also seen on the original package. Here's the front of the box, as well as a size comparison with a (legititmate!) Rocka. I don't have the rest of the box with me, as I had to accommodate luggage space, but the back does not advertise the other legends, and it has a plastic handle on the top for you to carry the box around. 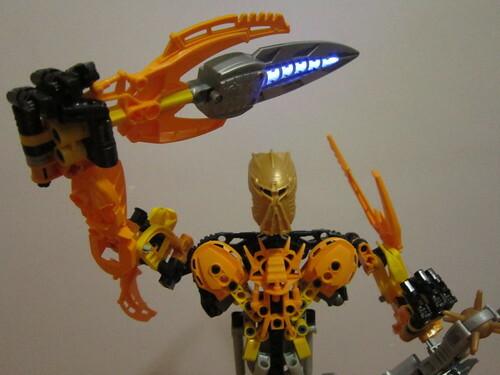 Toa Mata Nui retains his name, but now comes under the brand "Star Soldier", and carries the description: "The strongest and most active hero of the elite team. His power is more than enough to defeat any bad guy." Cheesy, but at least the English is grammatically correct and makes sense. 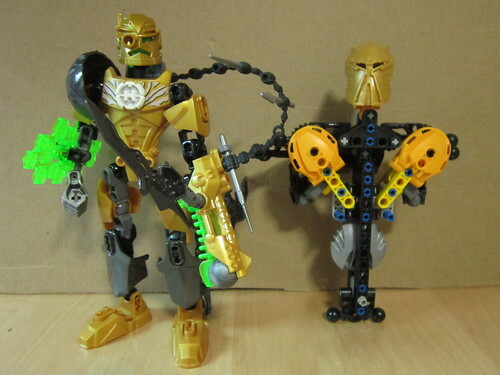 Opening the box up, here's what you get: a instruction manual, Bag 1 for the body, Bags 2 for the legs, Bag 3 for the hands, and the sword comes in a separate bag. 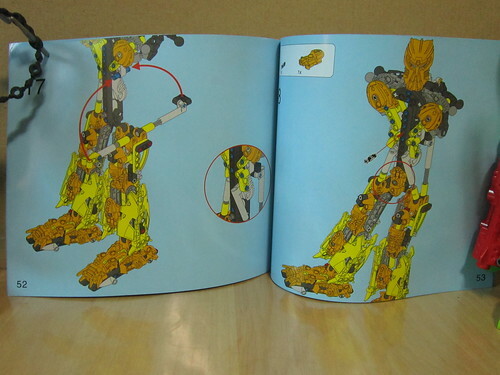 The manual is printed on glossy paper, and gives off the smell of a new magazine (sorry I smell stuff, that just how I am, lol). 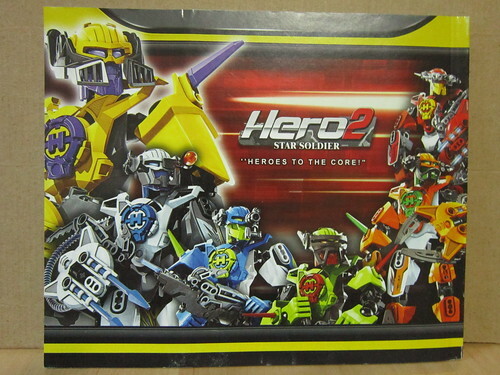 Cover shows off the exact same thing as the box front, and the back is an advertisement for "Hero 2 Star Soldier". Instructions printed inside are clear and easy to follow, and is on par with Lego standards (actually I guess it was ripped out from Lego), except there's no arena backdrop as what we got in the original. 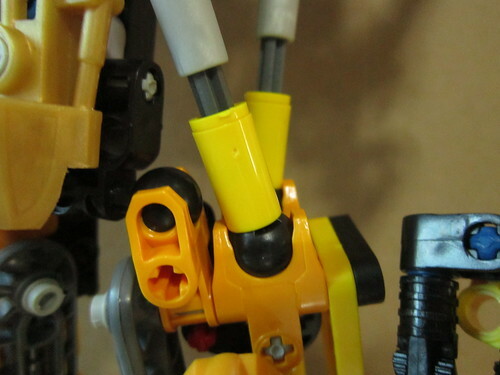 It's quite interesting to note that although Decool did rip the instructions off Lego, it did take the effort to edit it when it came to original pieces. We'll come to that later. 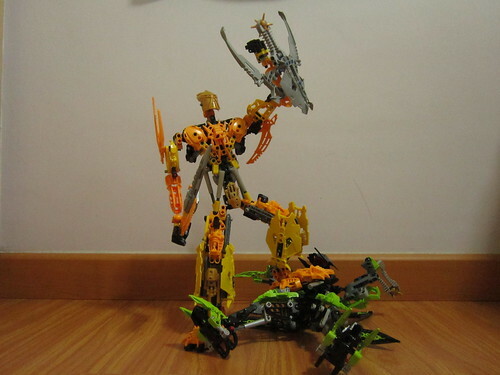 Overall, building this set was quite fun, as I haven't built a Bionicle/ HF set in over a year. 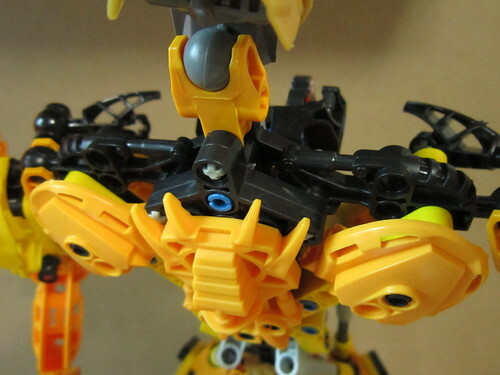 I do have qualms with the build however, and a kind of sloppiness on the designer's part showed through; but that isn't Decool's fault, it's Lego's. WHY ARE THERE SO MANY LOOSE AXLE ENDS STICKING OUT ALL OVER THE PLACE?! On the quality of the build, I do have some issues. 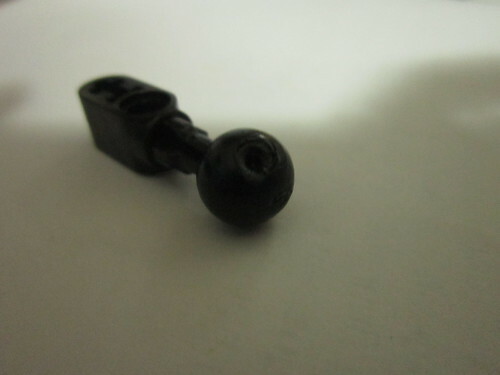 As with knockoffs, parts can come across tight and sometimes loose. The former is seen 90% of the time, especially with the cross pins. 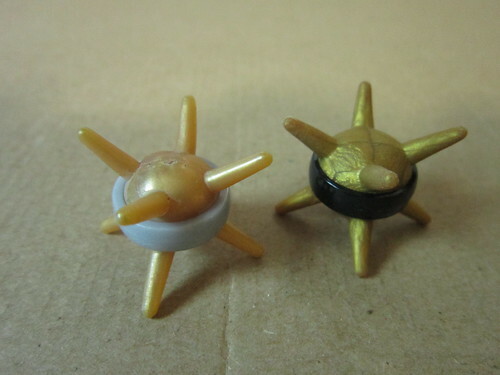 A hard surface comes in handy when trying to force in tight pins. So far, only about five loose pieces come into mind, but most are covered up and pose no major problem to the figure. And the nubs. I've only snipped off those that pose a hindrance to the build or are enough of an eyesore for me to not want to see them. They might be everywhere, but unless you are really nick-picky, they don't pose much of a problem either. The finger pieces work fine, though one was a little loose. I swapped it with another extra piece and that did the job. 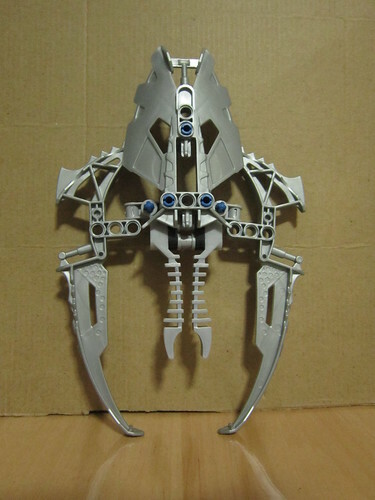 Shield pincers, though, were horribly loose, and there aren't anything else to hold it tighter. This makes the shield pincers all too ready to open and close. I'm not going to go through the building experience of each part in detail, cause, they're about the same as the original. Despite being a knock/rip-off, it's heartening to see Decool change some elements of the set. Some of these changes work to the improvement of the set, while others not so much. 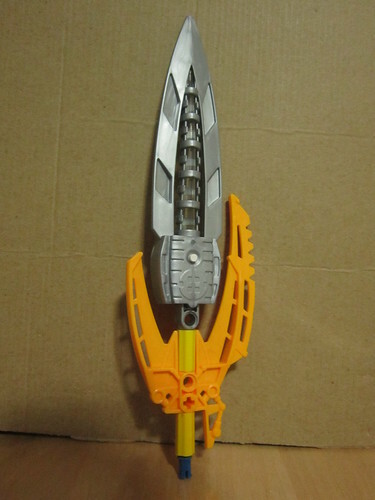 1) The most obvious modification of all is to the sword blade. It now comes with a HF logo (seriously?! Why?!) and it lights up. Yeah, it does. This functions similarly to any Inika Blade, and it glows a cool blue. 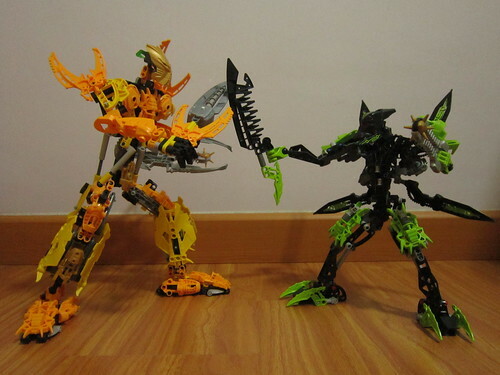 Despite being there, the HF logo does not ruin the cohesiveness of the set as it's quite subtly moulded onto the blade. Depending on you, the light-up feature may be a pro or a con. It's a pro for me: who doesn't like additional features? 2) The shoulders (Hordika limbs) have been moulded in black and not grey, as was the original. 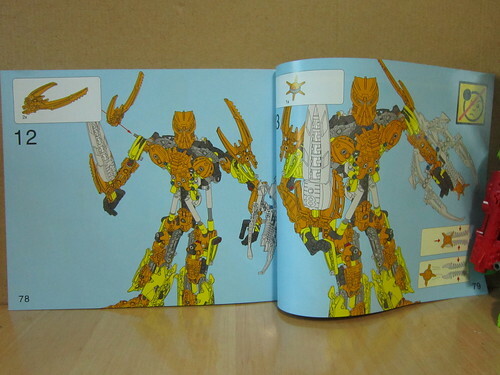 This, in my opinion, helps the set, as they fit in better with the colour scheme than their grey counterparts. 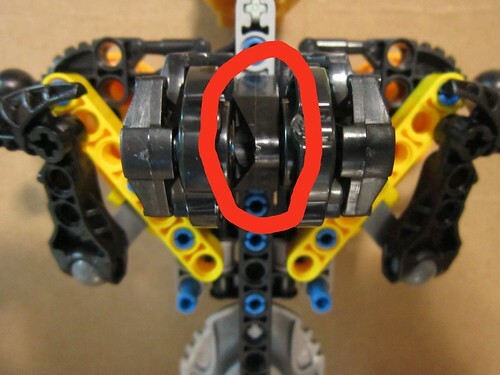 WHY OH WHY DECOOL DID YOU CHANGE THIS PIECE TO ANOTHER ONE?! 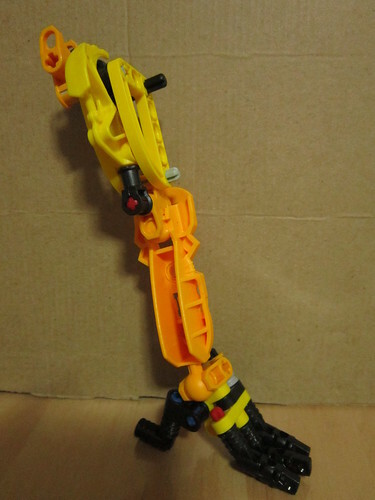 It was supposed to be the flat foot piece, not the curved one. Thankfully, this did not hinder the set much as the surrounding pieces helped sandwich it securely into place. 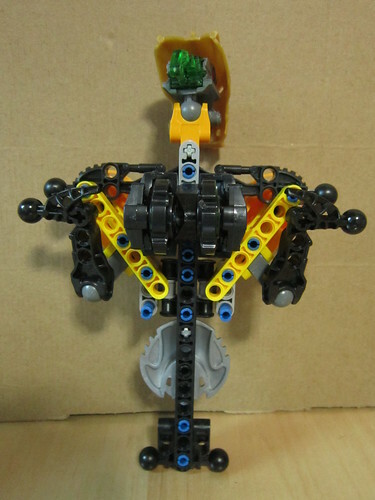 But still, it got me quite irritated when I was building it. 2) The thornax band has been changed from black to grey its actually silver, i just realised. On one hand, it does make it look rather strange, but on the other, it does fit with the huge chunk of grey/ silver which is the shield/ shooter. Besides the colour difference, the thornax is slightly less bouncy but still does the job in firing. First impression: This guy is HUGE. He makes Tuma look like a canister set, haha. 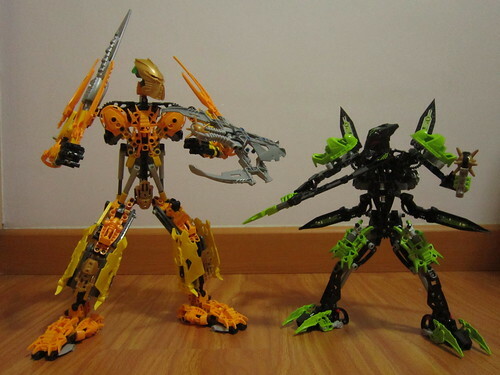 Being a knockoff, the quality, build-wise, piece-wise and playability-wise, is satisfactory. Beat that, he's incredible. From afar, this giant can almost come across as a legitimate Lego set. Adding on the light-up feature does add on to the epicness of the set. 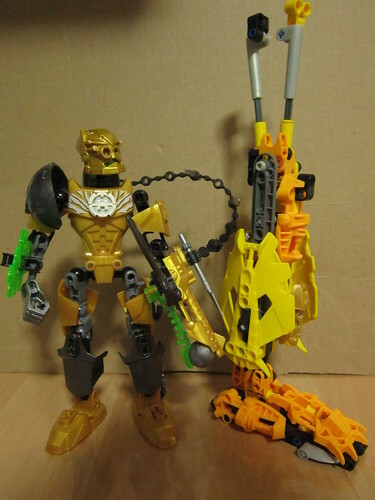 Would I recommend this set to anybody? 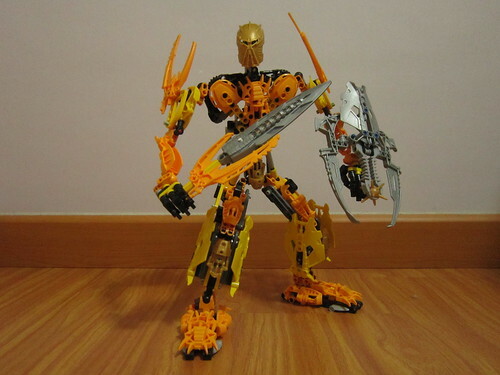 Well, if you aren't too picky about quality, or about copyright issues, then yes, this guy can pose as a (much!) 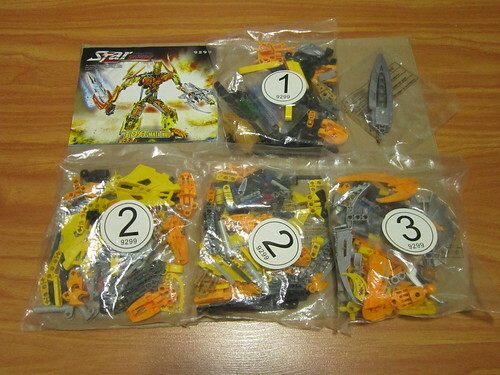 cheaper and worthy alternative; I've only gotten this guy for around RMB 130+ (USD 21.44+) Decool sure has come a long way in ripping-off (*cough*), and I can safely say they have been improving since I bought a set from them 6/7 years ago. Let's end this off with a fight! TMN: ARRR!!! 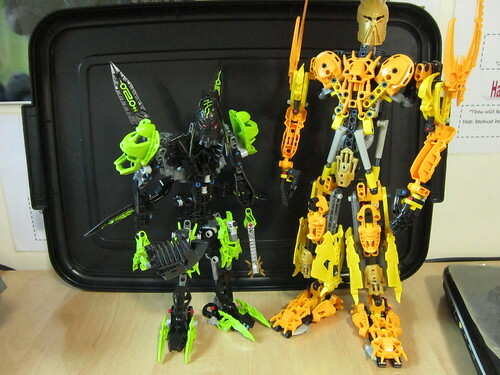 I'm the strongest there is in the Decool Universe! Tuma: What's this? A rip-off? I'll defeat him in no time to make up for my loss to the real TMN!!! TMN: You dare challenge me?! TMN: Enough! Time to end this! TMN: I'VE GOT THE POWERRRRRRRRRRRRR! ! ! ! ! ! ! ! ! Tuma: ?! What sorcery is this? !